On View> Indianapolis Museum of Art Showing "Ai Weiwei: According to What?" 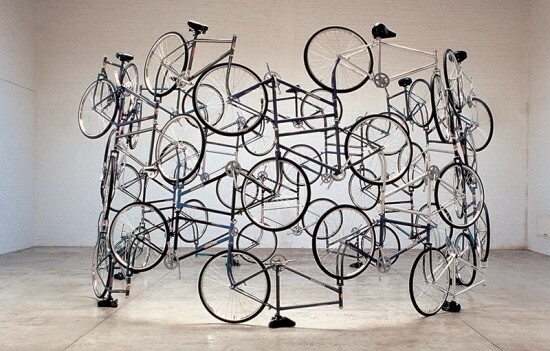 - Archpaper.com On View> Indianapolis Museum of Art Showing "Ai Weiwei: According to What?" Ai Weiwei is internationally recognized as one of China’s most controversial and influential contemporary artists. In his exhibition Ai Weiwei: According to What?, the artist, through various media (sculpture, photography, architectural installations, and video), boldly addresses issues of human rights in China and comments on the nation’s history, traditions, and politics. The exhibit features more than 30 works spanning more than 20 years. One is an early work, Forever (2003), in which Ai arranged 42 Forever brand bicycles into a circle, to honor China’s most popular, and reliable (the bicycles were made of heavy-duty steel), mode of transportation during the mid-1900s. The exhibit is also devoted to Ai’s more provocative pieces, such as a 38-ton steel carpet entitled Straight (2008). The artist used rusted steel rebar taken from the remains of a poorly-built school that collapsed during the 2008 Sichuan earthquake that tragically killed more than 5,000 schoolchildren. The piece commemorates the thousands of lost lives while openly condemning the Chinese government’s stance on human rights.